The photographs are taken of live and spread moths. The live moths are captured in containers, photographed and then released. Most of the spread images were provided and identified by Dr. John Glaser of Berkeley Springs, WV. Two photographs show the setups that are used at home. Fig. 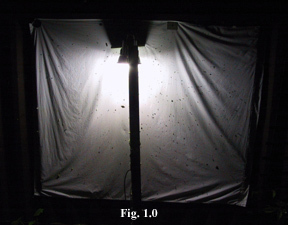 1.0 is a mercury vapor lamp illuminating a white sheet. Fig. 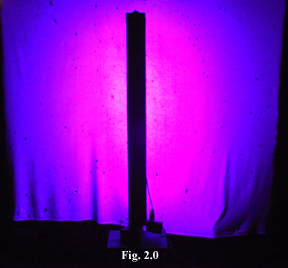 2.0 is two 4 ft. black lights illuminating a white sheet between our garage doors. The lights are on timers. They also cause the neighbors to wonder what is going on! Out-of-state moth photographs are taken when we travel on birding excursions. Thus, we have moth images from Santa Ana NWR, Texas; the San Pedro River near Sierra Vista, Arizona; Calaveras Big Tree Sate Park and Mono Lake, Lee Vining, California. John Glaser of Berkeley Springs is providing images of West Virginia species that have not been recorded from Maryland. The images are arranged according to R. Hodges "Check List of the Lepidoptera of America North of Mexico (1983)." The images can be displayed by clicking on the Latin name of the species. There could be errors in the image identification. If you are aware of errors, please e-mail me under the 'Submit a Comment' links beneath each image. The moth images taken from our residence will simply have an H for home as the location. Most of the spread images with a copyright by John Glaser were provided and identified by him. Unidentified moths will also be included in a separate location. Any help in identifying these moths would be appreciated. I am certainly an amateur at this interesting hobby. Many thanks go to the webmaster, Steven Line, who spent countless hours designing a program that I could use to uplink images and data. I want to especially thank Dr. John Glaser of Berkeley Springs, WV, previously a resident of Baltimore, MD till 2005, who has provided and identified many specimens that I would not have seen in Clarksville. A moth collector for about 25 years, he recently donated most of his extensive collection to the U.S.N.M. James Adams, Dept.of Natural Science, Dalton State College, Dalton, GA.
David Adamski, Systematic Entomology Lab., USDA @ NMNH,Wash., DC. John Brown, Systematic Entomology Lab., USDA @ NMNH,Wash., DC. Donald R. Davis, Dept. of Entomology, NMNH, Wash., DC. The late Douglas C. Ferguson ,who identified many of John Glaser's moths. Ronald W. Hodges, Editor-in-Chief of the "Moths of America North of Mexico" series of Fascicles. Edward C. Knudson, who identified the Texas images. J. Donald Lafontaine, Agriculture, Canada. Ronald Leuschner, Manhattan Beach, CA who identified the AZ and CA moths. Robert Patterson, Moth Photographers Group. Brian Scholtens, Biology Dept., College of Charleston, SC. Ms. Lynn Scott, Ontario, Canada. Reed Watkins, Pterophorid moth expert, Eastern Shore, MD. The following references were utilized: "A Field Guide to the Moths of Eastern North America" by Charles V.Covell, Jr.; "The Moth Book" by W. J. Holland; "The Owlet Moths of Ohio" by Roy W. Rings, Eric H. Metzler, Fred J. Arnold, and David H. Harris; "The Cutworm Moths of Ontario and Q" by Eric W. Rockburne and . J. Donald Lafontaine; and the series of Fascicles produced by the Wedge Entomological Research Foundation. "A Checklist of the Moths of Maryland", compiled by John Glaser, the late H. G. Stevenson, and the late Douglas C. Ferguson is available on CD for anyone desiring it for a nominal fee.